The Co-operative Hall, Bolton, was the scene of much mirth and humour last Saturday evening, for it was the final meeting of the claimants to what has so often been referred to as "The Entwisle Millions." 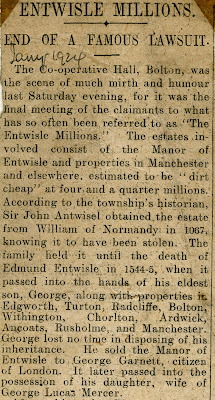 The estates involved consist of the Manor of Entwisle and properties in Manchester and elsewhere, estimated to be '' dirt cheap'' at four and a quarter millions. According to the township's historian, Sir John Antwisel obtained the estate from William of Normandy in 1067, knowing it to have been stolen. 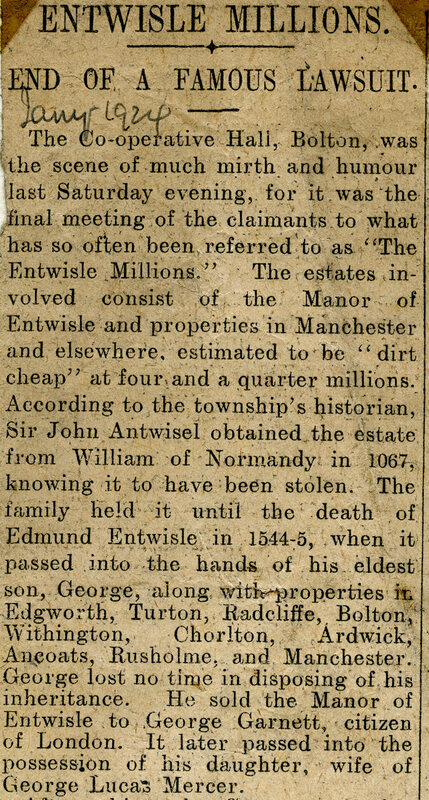 The family held it until the death of Edmund Entwisle in 1544-5, when it passed into the hands of his eldest son, George, along with properties in Edgworth, Turton, Radcliffe, Bolton, Withington, Chorlton, Ardwick, Ancoats, Eusholme, and Manchester. George lost no time in disposing of his inheritance. He sold the Manor of Entwisle to George Garnett, citizen of London. It later passed into the possession of his daughter, wife of George Lucas Mercer. After this sale George and his rascally father-in-law, Thurstan Tyldesley, made out a spurious mortgage deed, and sought to deprive Garnett of his property, but failed owing to the date of his deed, 1551. Nothing daunted, they made out another, bearing date 1546. then began litigation which was carried on intermittently until 1571, when the case was decided at Lancaster in Tyldesley's favour. Thurstan Tyldesley having died, Garnett also, and his son-in-law deposed, two of George Entwisle's brothers—Alexander and Richard—made several attempts to regain possession from Edward Tyldesley, Thurstan's second son, knowing that he had no title deeds to the property. Tyldesley, on his part accused Alexander of possessing them, and instituted various lawsuits to obtain them. The matter culminated in what was known as "The Great Trial," at Lancaster, in 1577. The result was, things remained as they were. As can be seen from other postings, Thurstan Tyldesley who died in 1554 was hardly a rascal and even this account accepts that the outcome of the case in 1571 was in his favour.